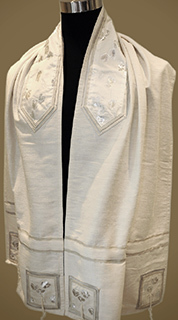 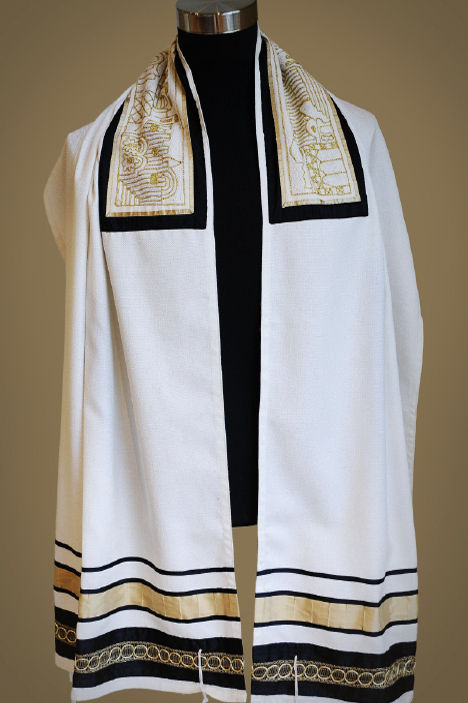 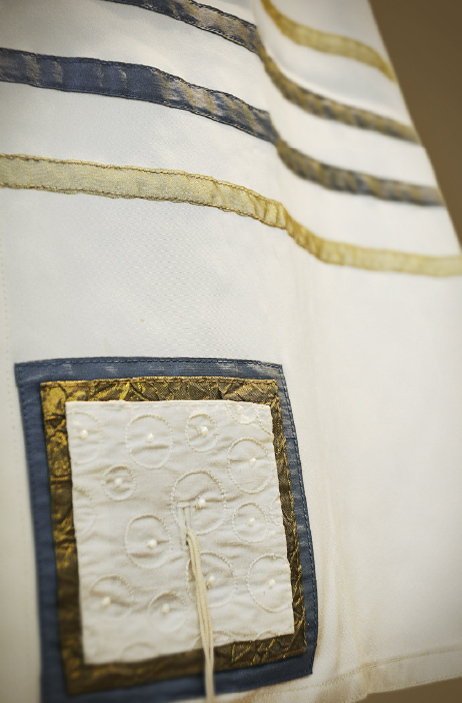 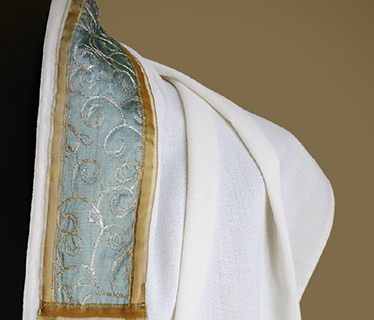 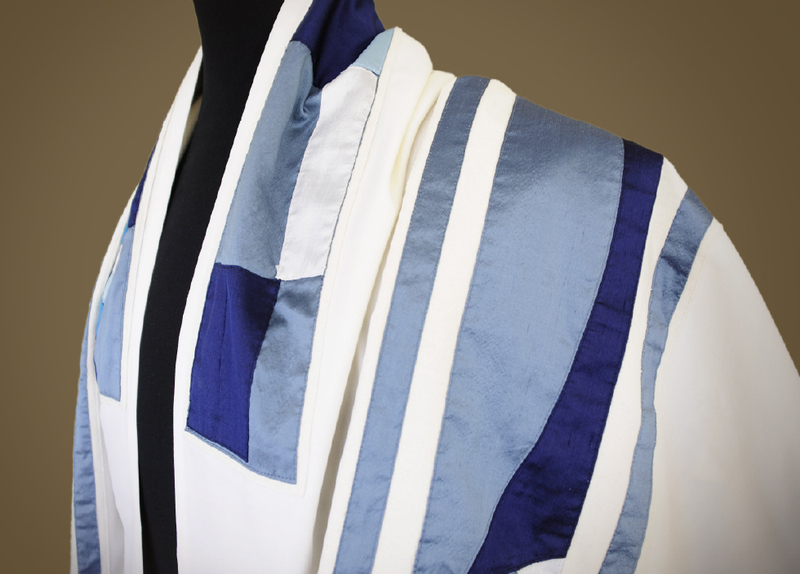 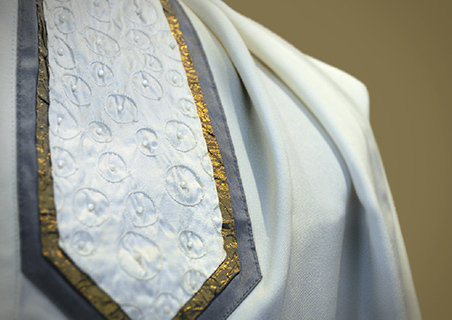 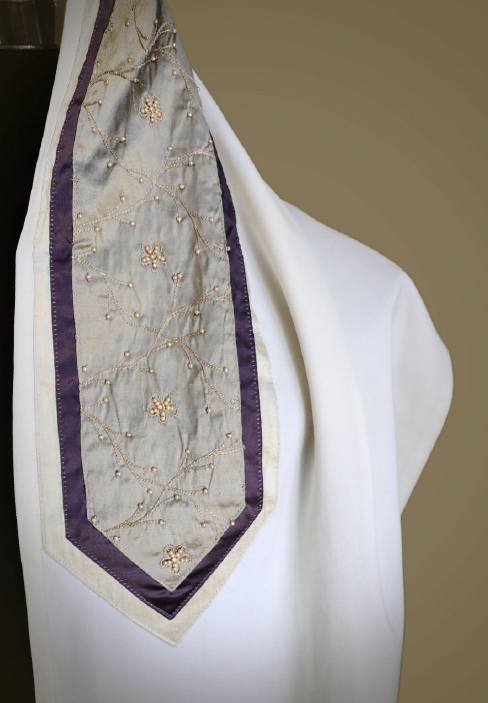 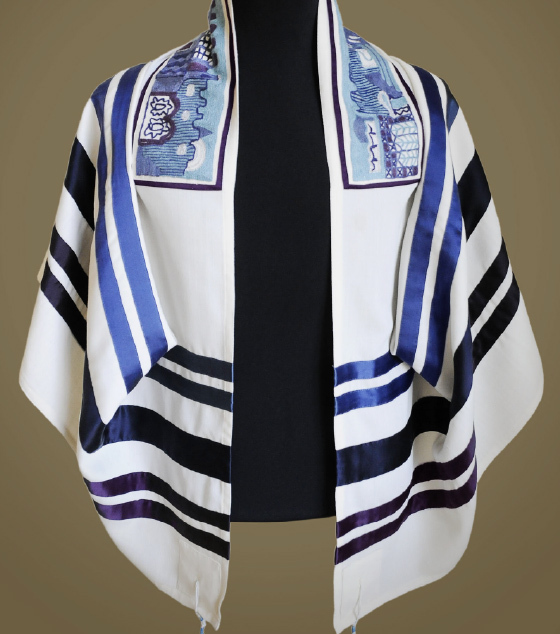 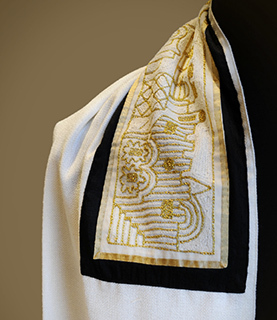 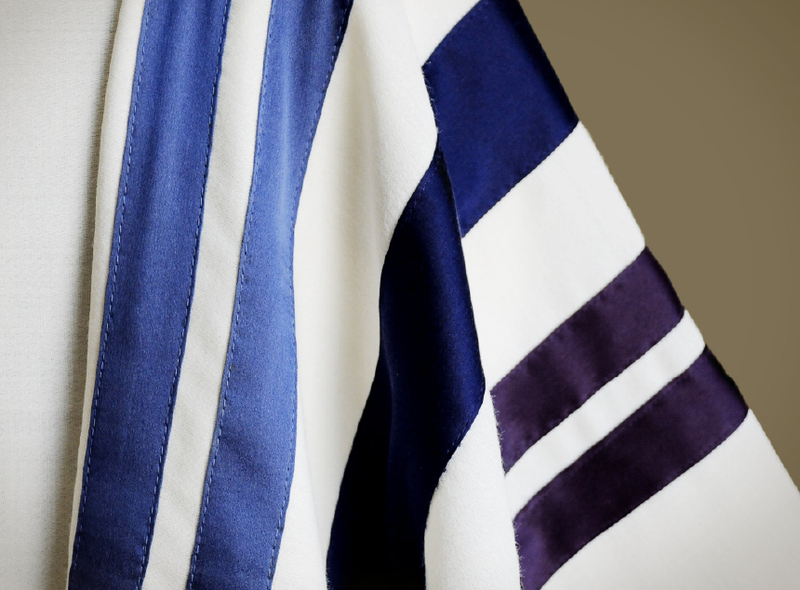 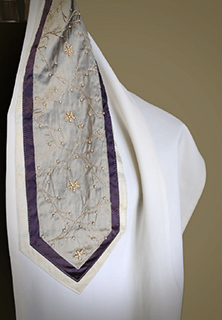 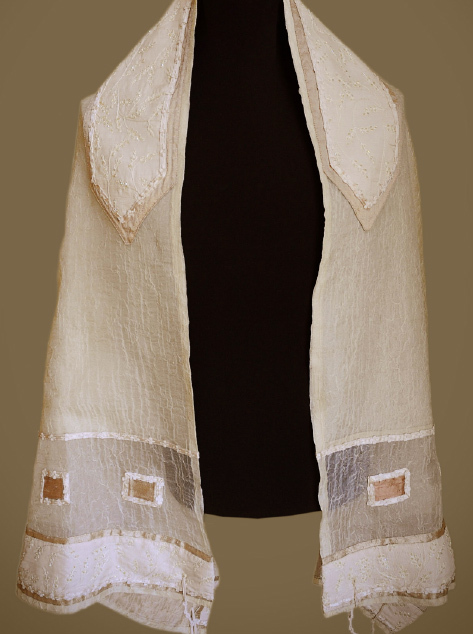 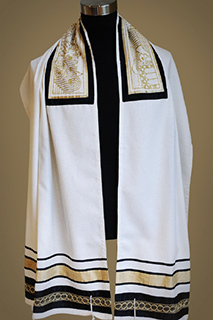 Imagine yourself in a moment of prayer… wrapped in an Haute Tallit. Using fabrics sourced from the world’s finest textile mills, designer Elise Farfel Wolf transforms the artistry of tallit design. 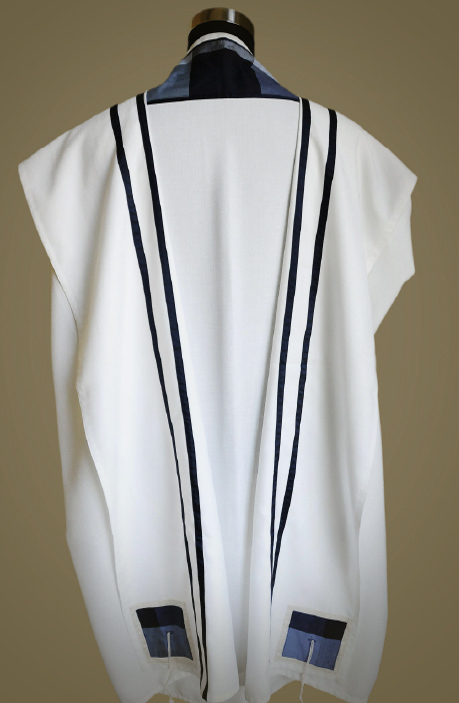 Haute Tallit is sophisticated, elegant and timeless; contemporary yet classic, and always dignified. Refined and couture. 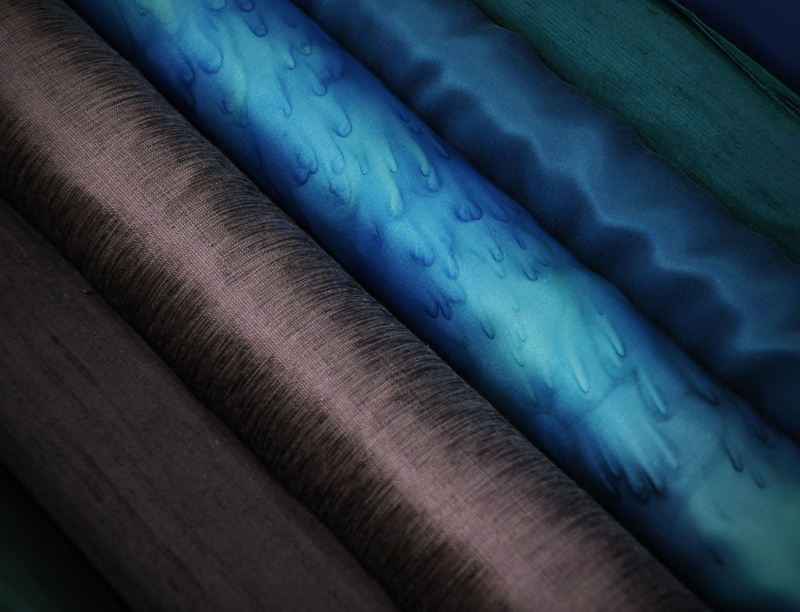 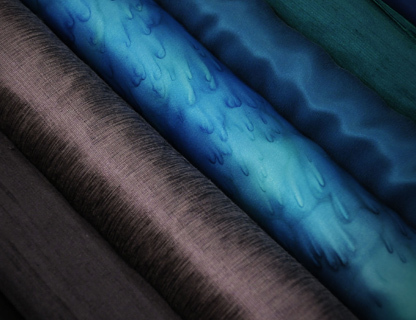 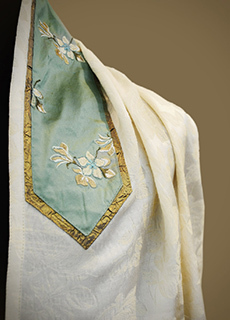 Italian silks and wools. 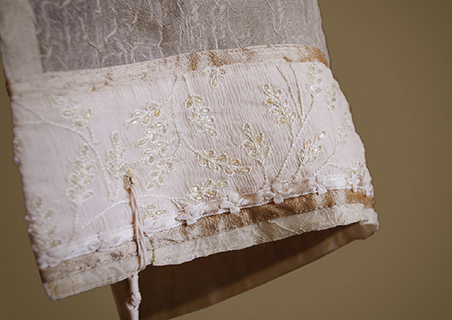 French vintage trim. 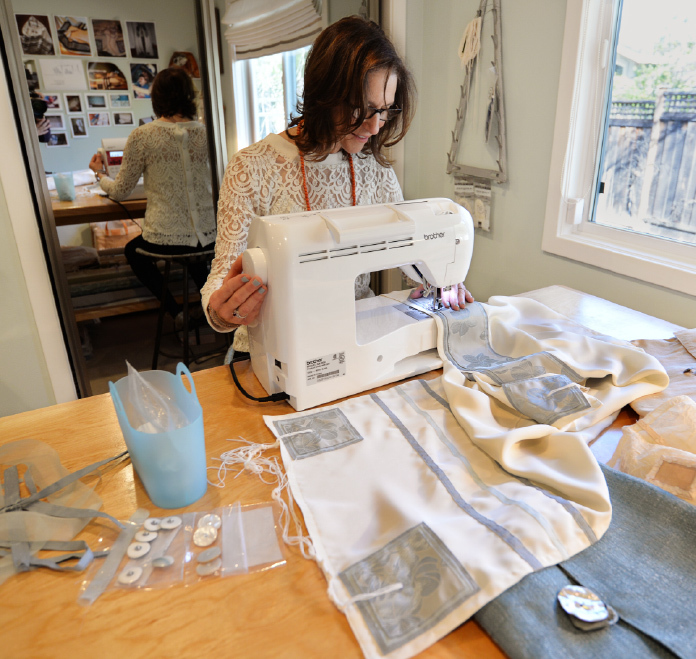 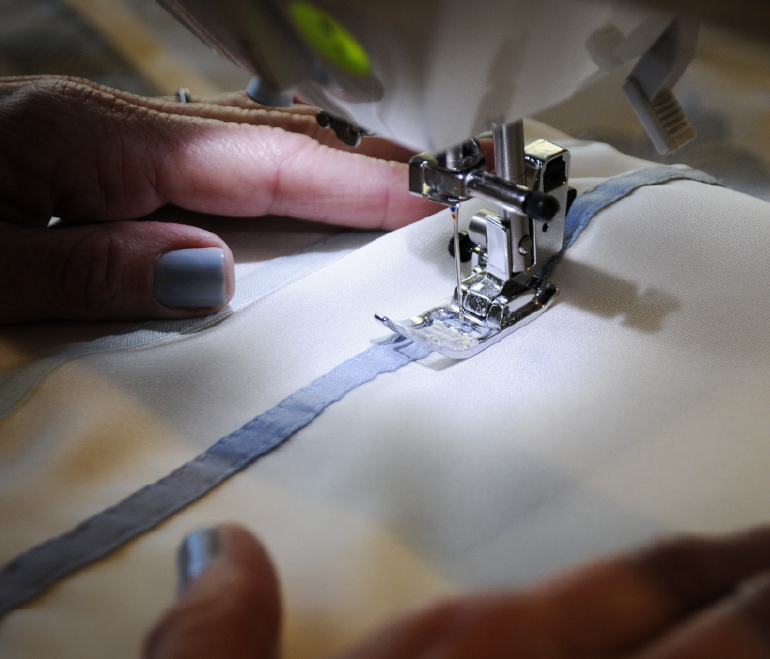 Designer fabrics from the houses of Armani, Calvin Klein, Carolina Herrera, Donna Karan, Oscar de la Renta, Valentino and Versace, endless possibilities abound when you enter Elise’s studio. 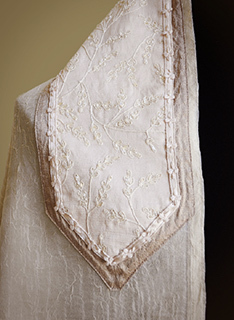 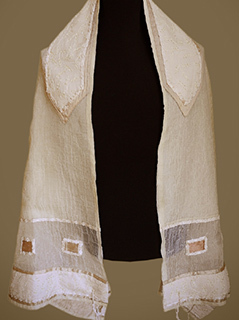 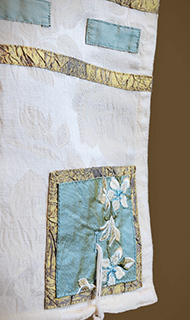 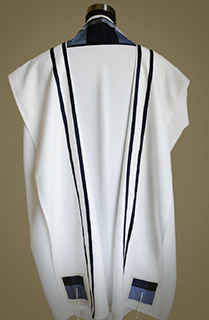 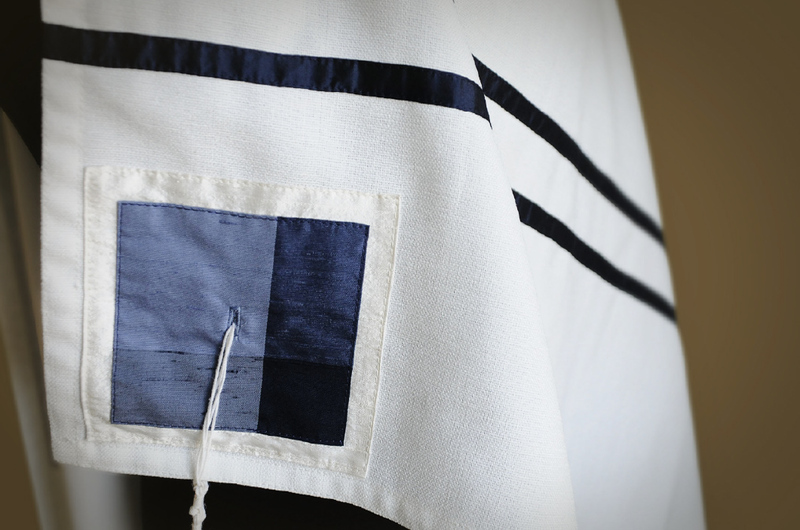 Each tallit is custom designed and hand-sewn by the artist in her studio in Northern California. Clean lines, subtle texture, monochromatic or accented with color, Haute Tallit designs have an element of the unexpected, yet are profoundly familiar. 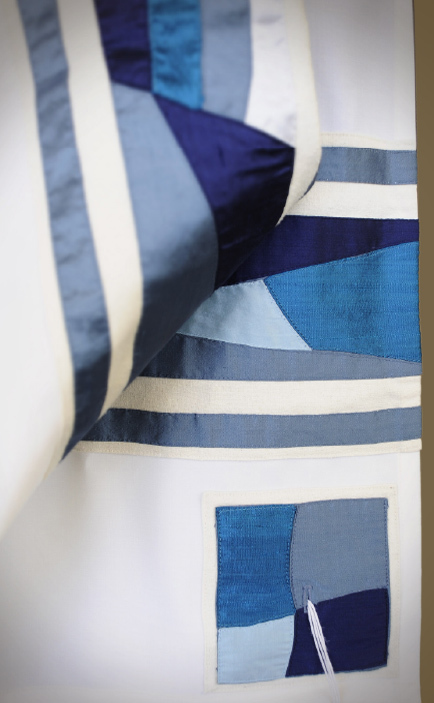 Working in the couture tradition of several one-on-one consultations and fittings, Elise begins with the inspiration – your special story, memory or photo, combined with your unique style – to begin the creative process for your tallit. 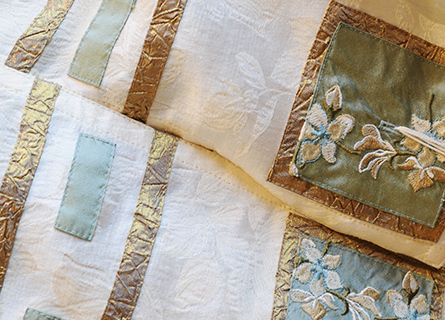 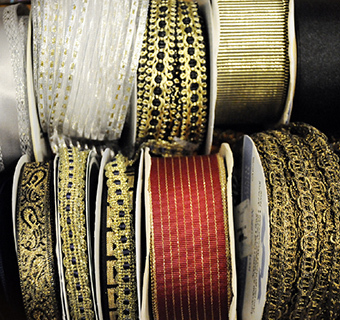 The studio has been creating divine couture since 2004 and has a stunning fabric collection. After a phone consultation, the artist collects sample fabrics in preparation for your first in-person meeting. 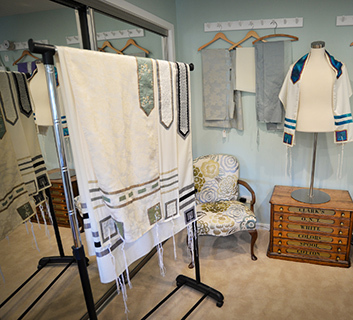 The artist will find just the right fabric to imbue your tallit with meaning, taking you from the ordinary and wrapping you in a sacred space. 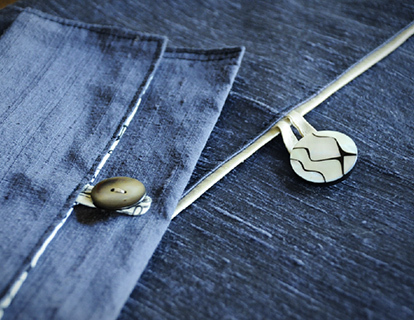 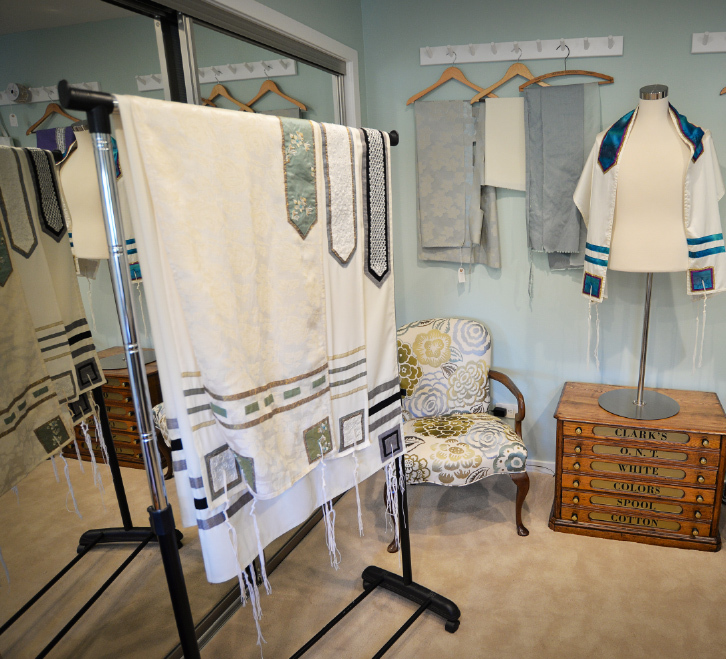 Fabrics are selected only from the finest shops in New York, San Francisco, Baltimore and Tel Aviv. 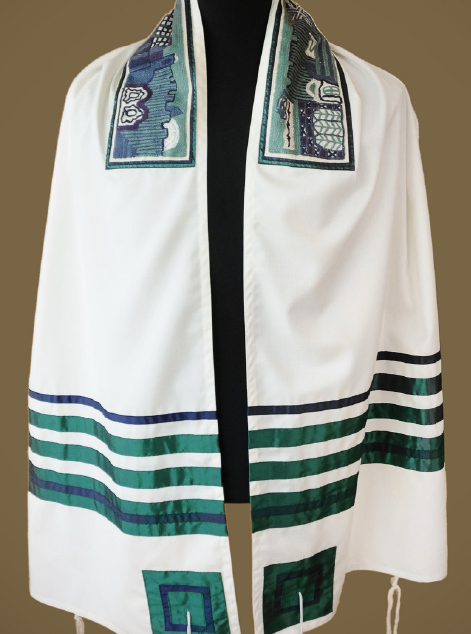 Your tallit will be an elegant, dignified, fresh-take on the classic tallit, with attention to the details befitting the Haute Tallit tradition. “I am inspired by the challenge of reinventing the traditional tallit and by my love for both the creative and the technical process of tallit making. 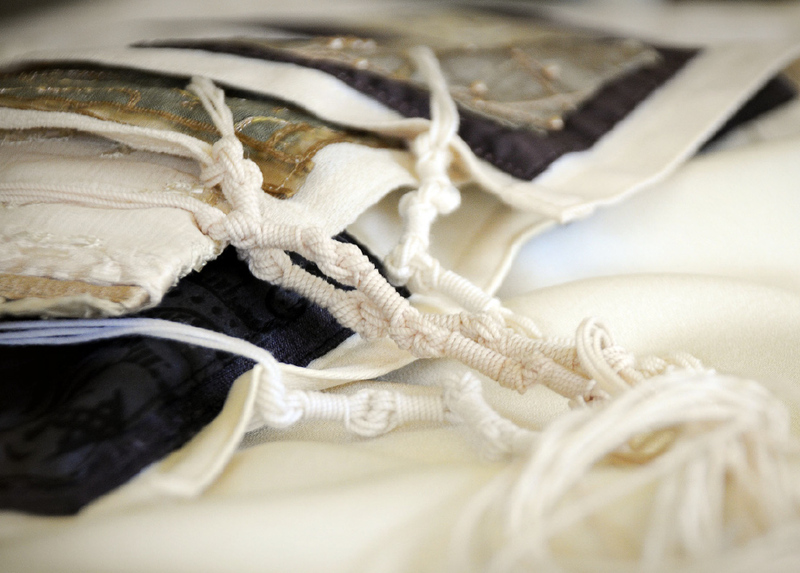 My hope is that as you wrap yourself in your Haute Tallit, you are enveloped with peace and calmness. 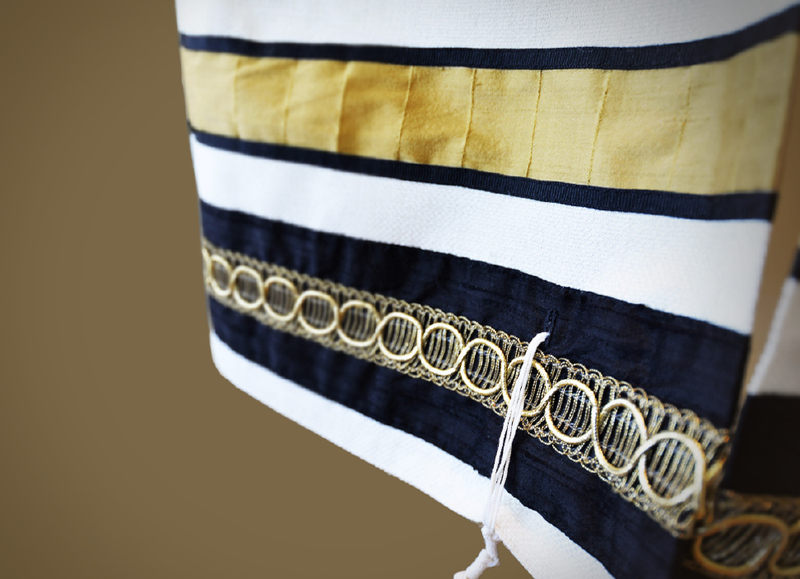 You are able to hear that still small voice, remember G-d’s words and teachings, and meditate on what the Mishnah means when we read that the world stands on three things: on Torah, on Service and on Acts of Loving-kindness. 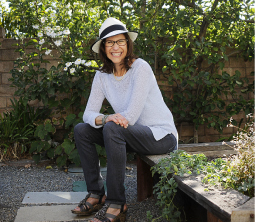 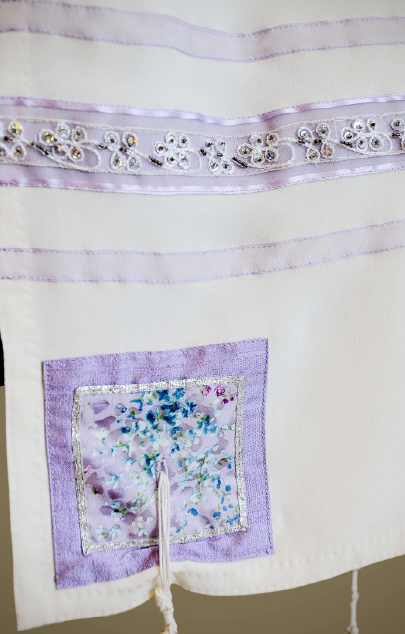 The work that inspires Elise, supports her value of Tikun Olam, repairing the world. 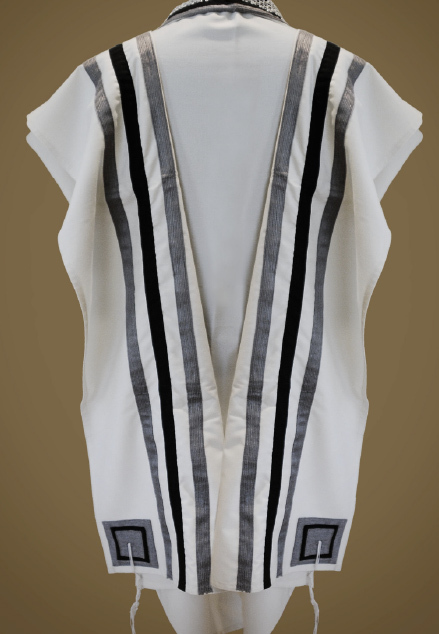 One hundred percent of the price of each Haute Tallit is donated to support Jewish causes locally and in Israel. 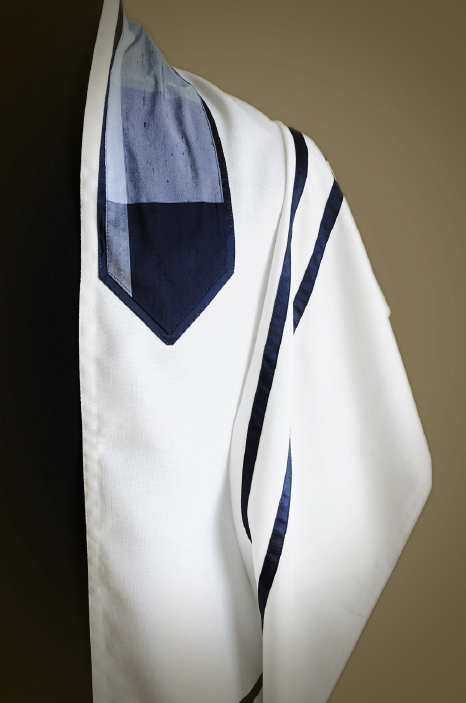 Q: How long does it take to make each tallit? 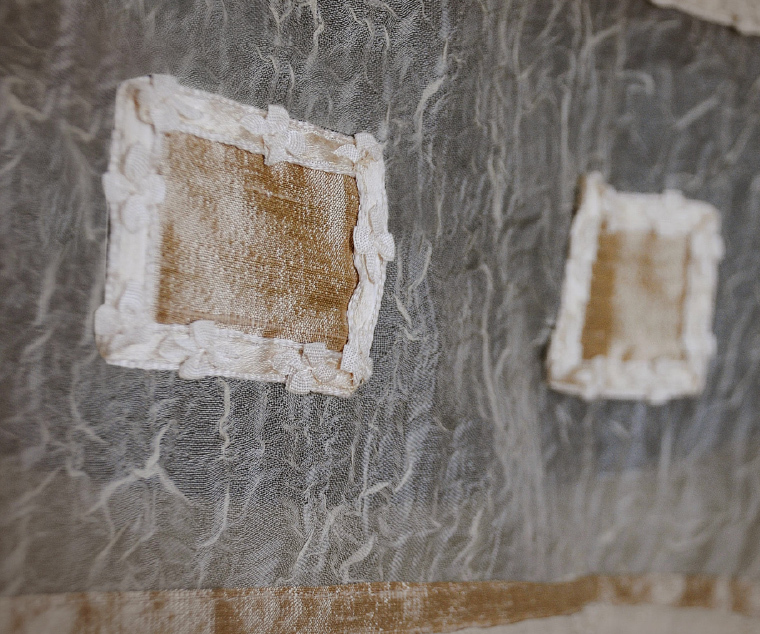 A: There is a richness to the process. 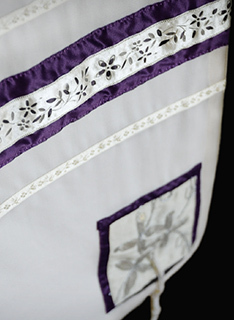 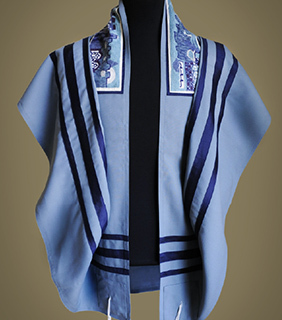 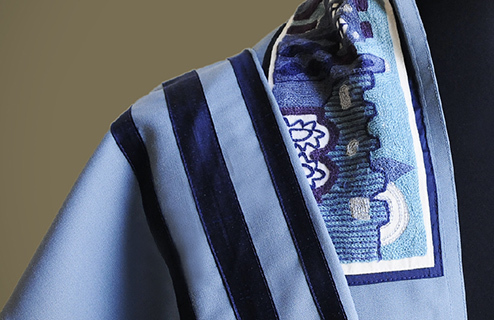 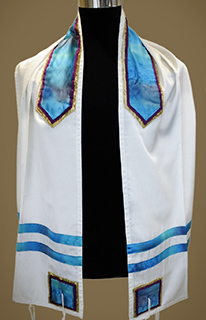 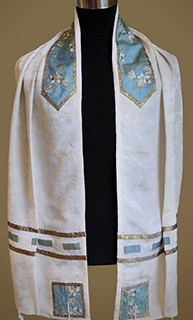 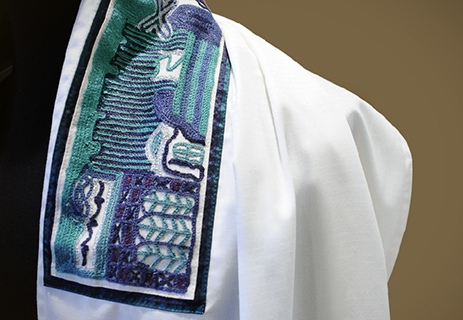 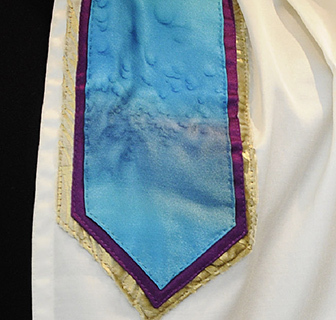 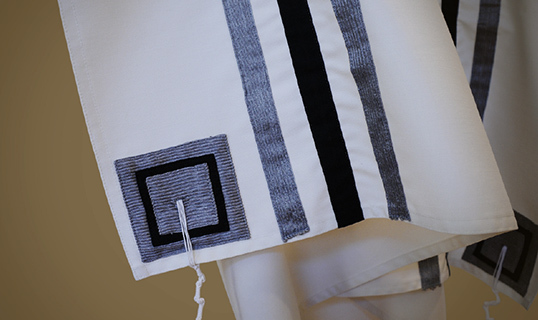 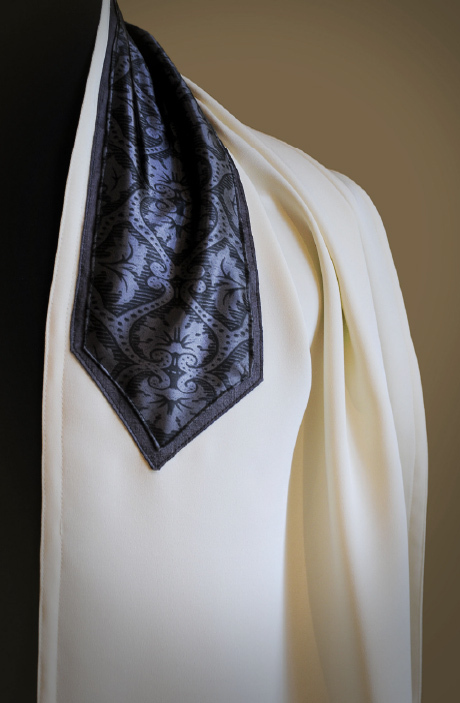 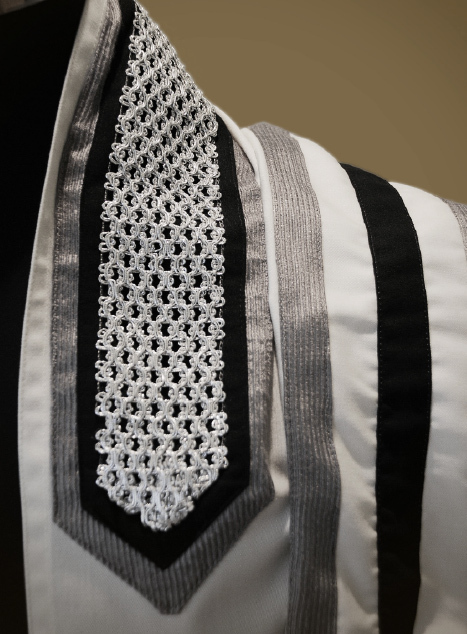 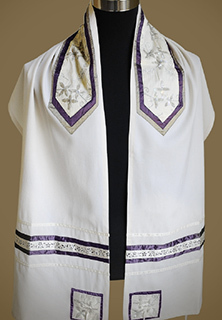 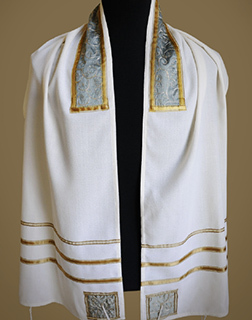 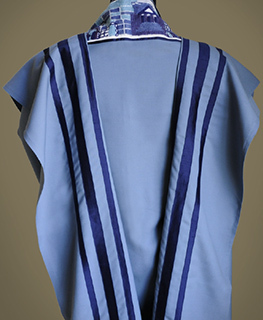 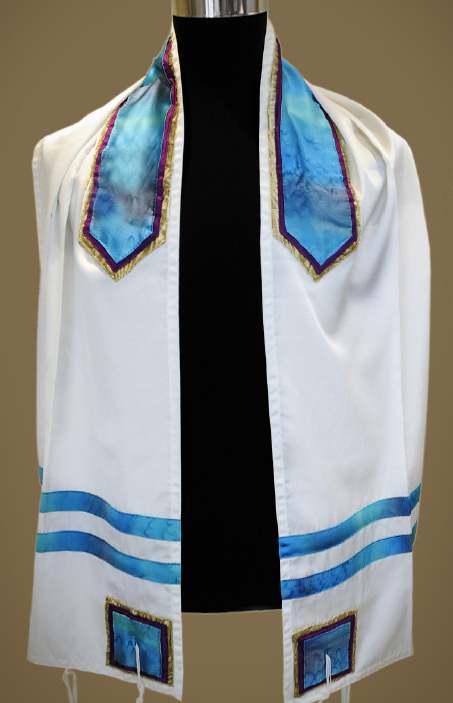 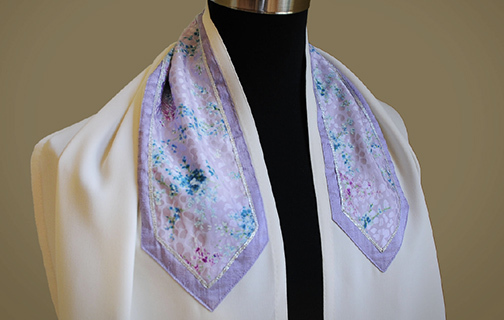 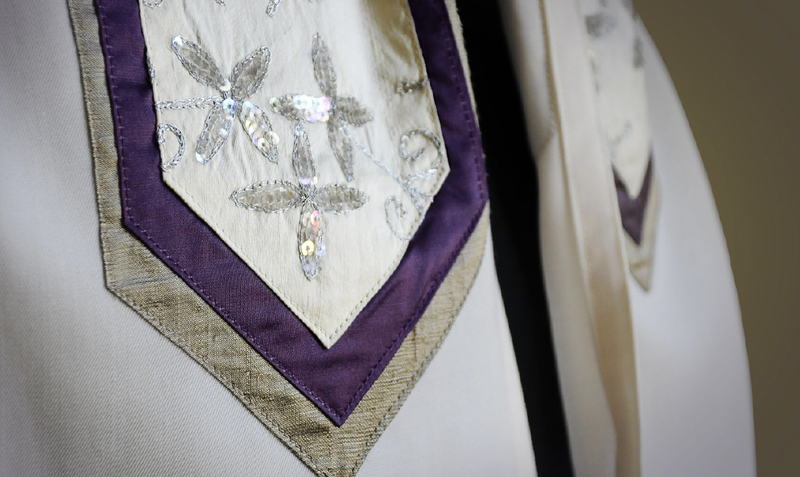 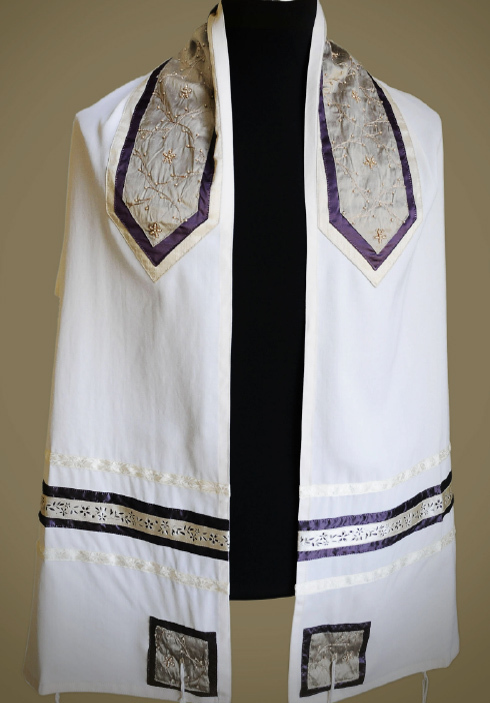 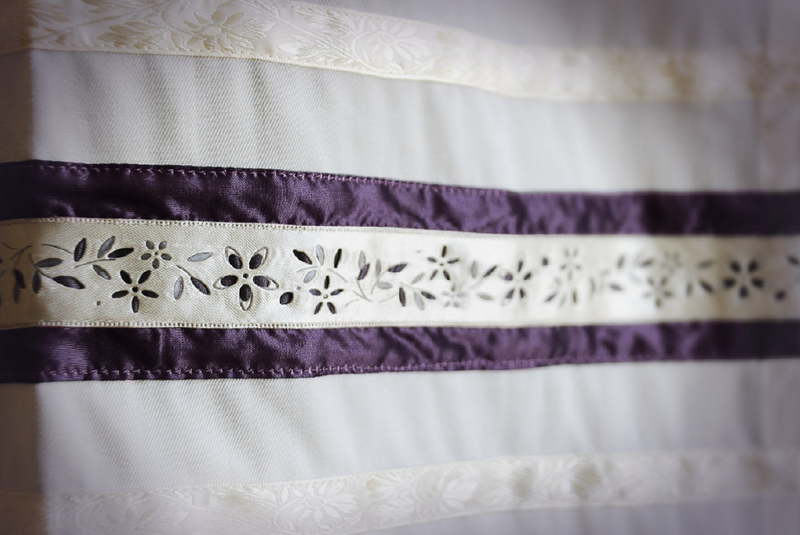 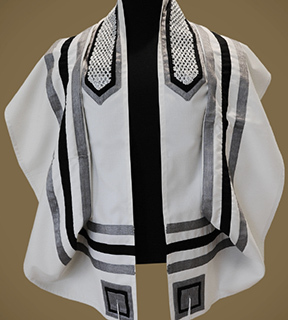 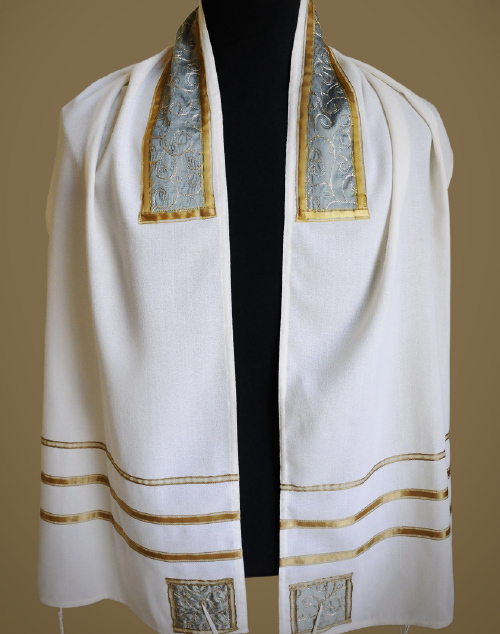 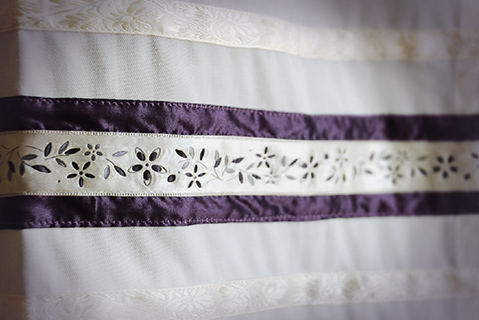 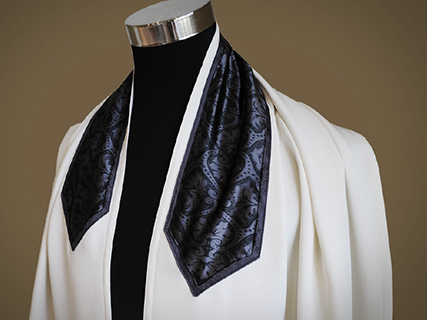 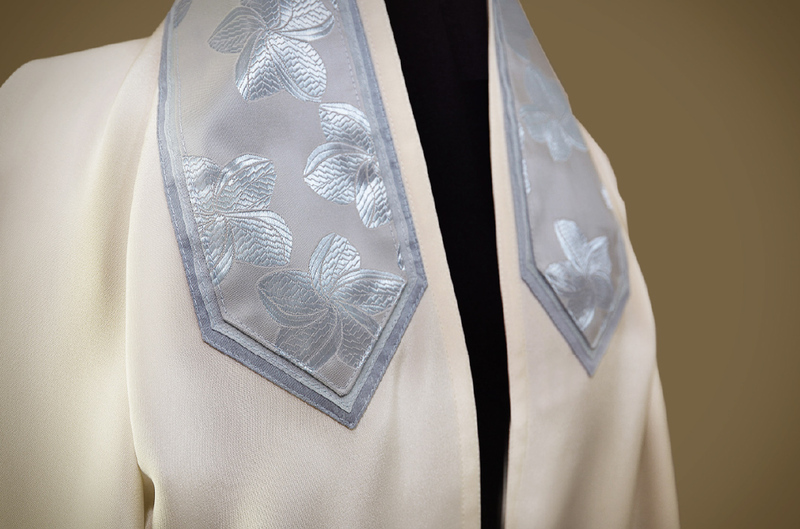 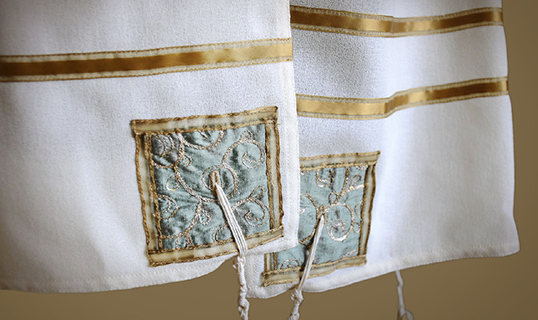 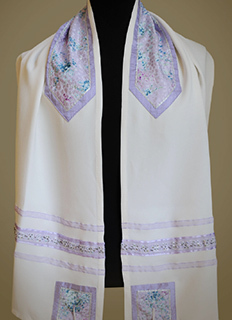 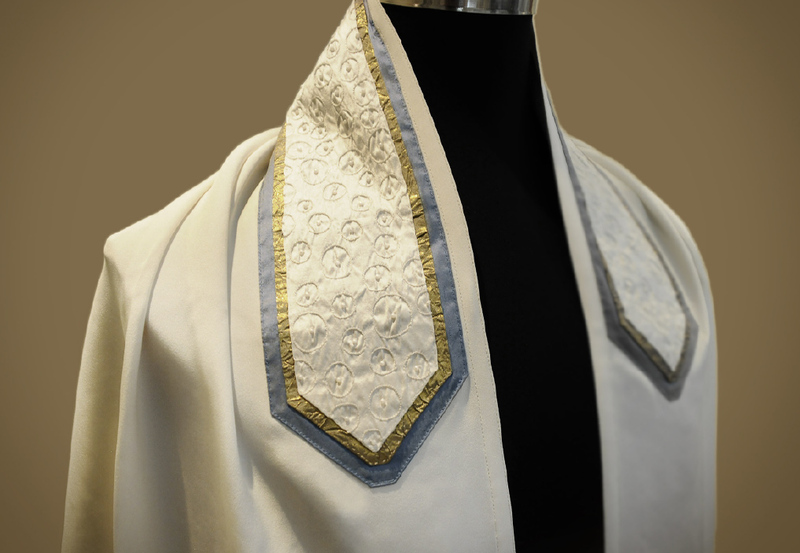 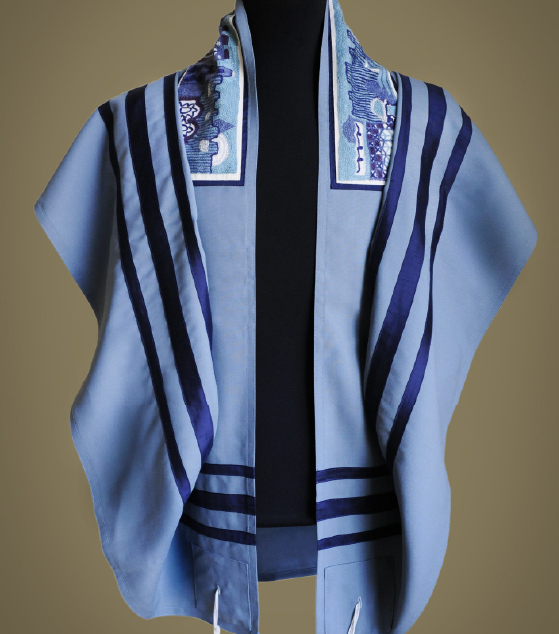 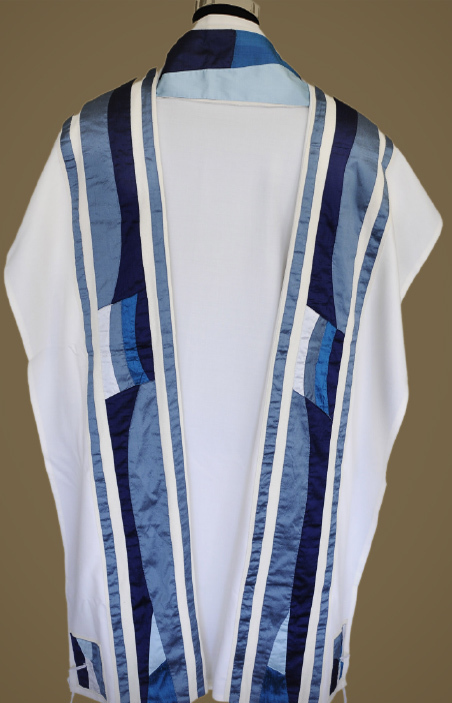 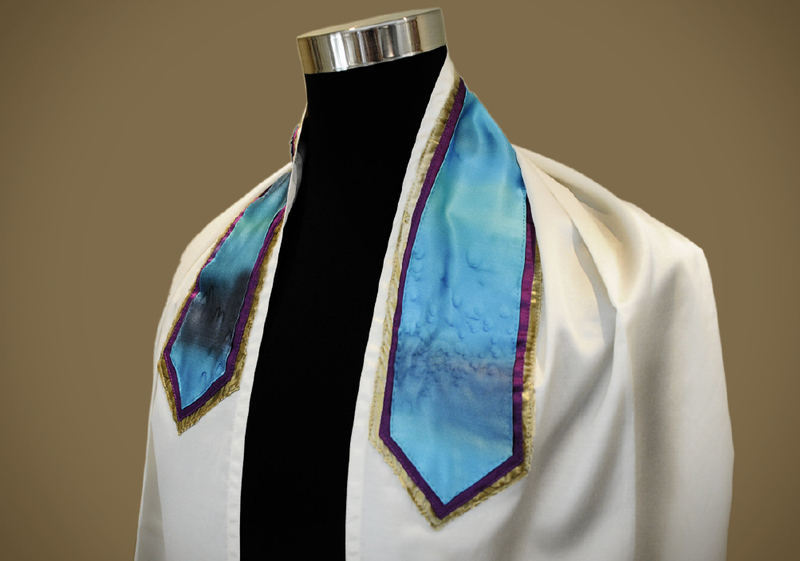 From the first phone conversation through in-person or online meetings to completion, each custom couture tallit generally takes a few months to complete. 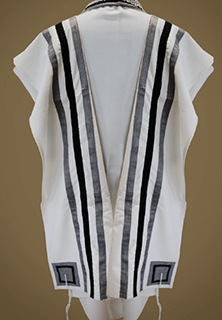 Q: What defines the Haute Tallit style? 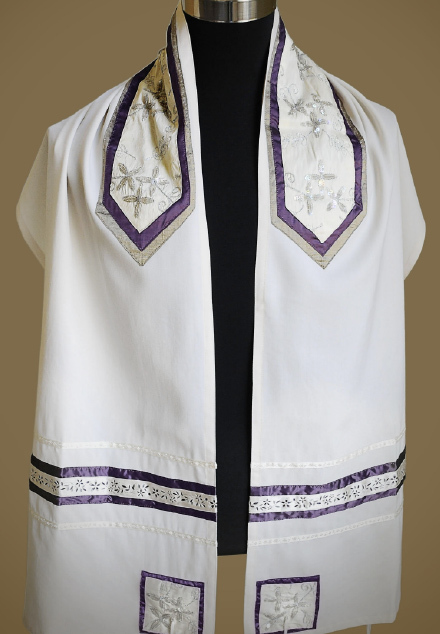 A: Haute Tallit style is sophisticated, elegant and timeless; contemporary yet classic and always dignified, using only the finest silks, wools, cottons and polyester fabrics. 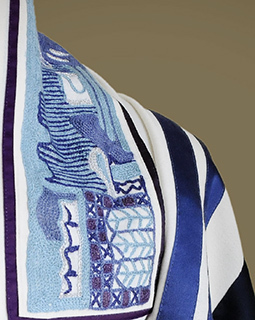 Q: What is the price of Haute Tallit? 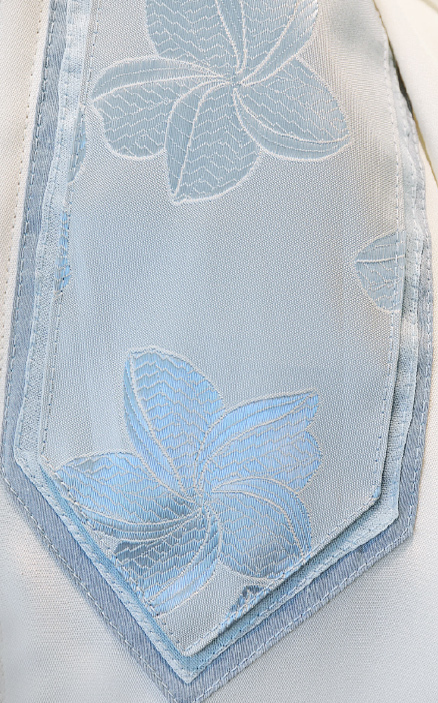 A: Prices vary depending upon fabrics selected and complexity of design. 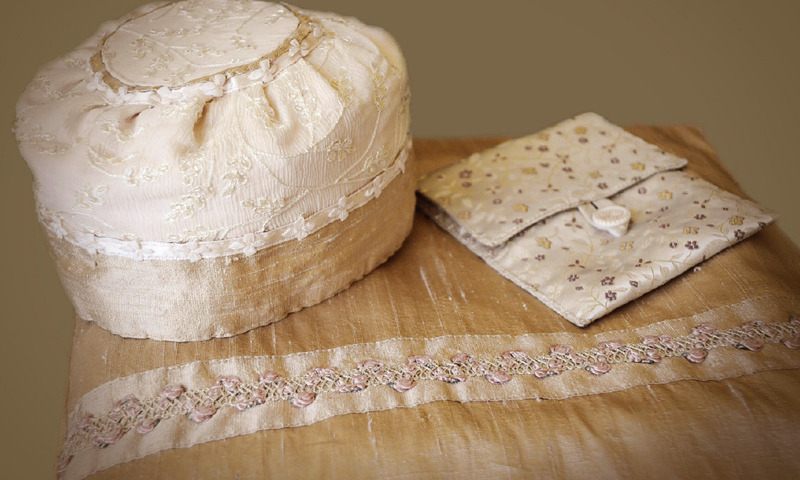 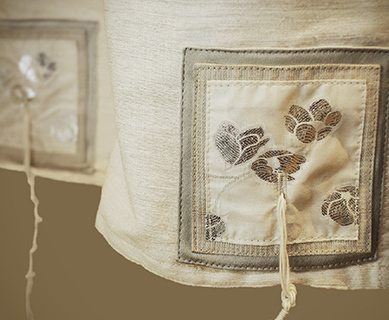 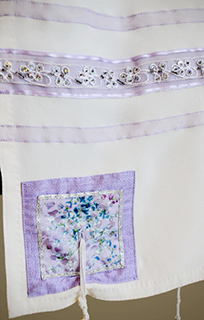 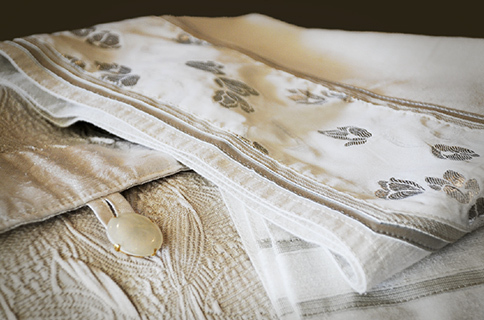 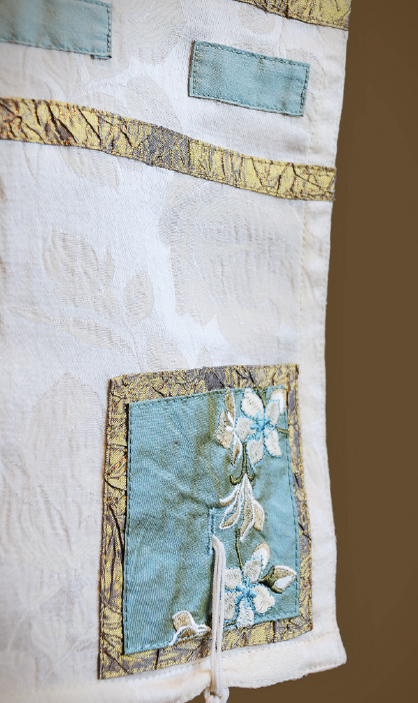 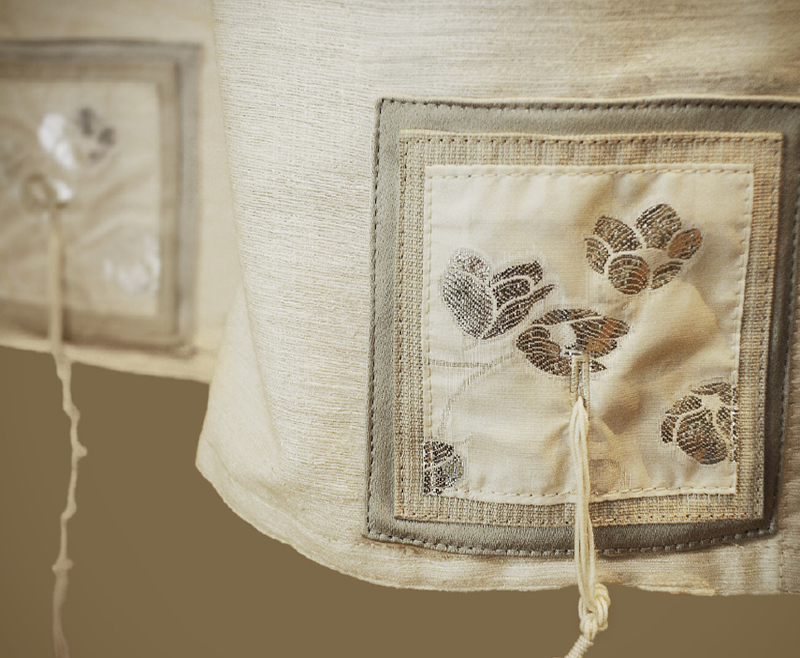 Each tallit comes with an exquisitely designed custom bag. Pricing for Tallit & bag begins at $700. 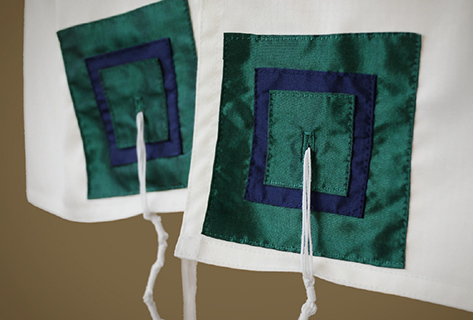 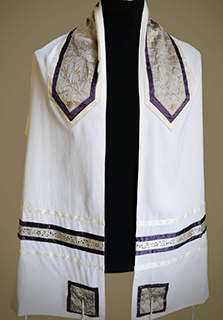 To commission your tallit, contact the artist directly to schedule your initial consultation.